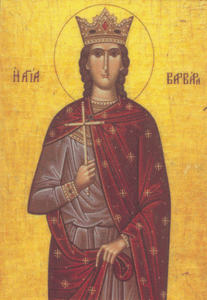 ST. BARBARA was brought up a heathen. A tyrannical father, Dioscorus, had kept her jealously secluded in a lonely tower which he had built for the purpose. Here in her forced solitude, she gave herself to prayer and study, and contrived to receive instruction and Baptism by stealth from a Christian priest. Upon discovering his daughter’s conversion, Dioscorus was beside himself with rage. He himself denounced her before the civil tribunal. Barbara was horribly tortured, and at last was beheaded, her own father, merciless to the last, acting as her executioner. God, however, speedily punished her persecutors. While her soul was being borne by angels to Paradise, a flash of lightning struck Dioscorus, and he was hurried before the judgment-seat of God. Reflection.—Pray often against a sudden and unprovided death; and, above all, that you may be strengthened by the Holy Viaticum against the dangers of your last hour.